Andrew McGregor, co-founder of Graphation Film Festival. What do you get when you put together robots, zombies and comic books? How about a film festival? The Graphation Film Festival showcased a selection of short films about zombies, robots, robot-like humans, zombie-like mummies and other life-forms on the fringes of society last month. Thanks to Carnegie Mellon grad and former Pittsburgh resident George A. Romero, zombies are closely identified with Steeltown, so close-by suburban Oakmont’s Oaks Theater was the perfect venue to celebrate the not-quite-alive. The festival followed a similar event organizers Andrew McGregor and Josiah Golojuh hosted in the Los Angeles area. The idea: promote new filmmakers and adapt their works into comic books – a twist on the current Hollywood idea of taking comics and turning them into movies. Some of the shorts have earned recognition and awards at other festivals – Jesse Griffith’s “Cockpit: The Rule of Engagement,” starring “RoboCop’s” Ronny Cox, is an audience favorite – and many are available online, but more exposure never hurts. Not all the films were fiction. “Nobody Dies When It’s Sunny,” a documentary by Niles Harrison, follows around a mortuary driver as he picks up bodies – at least one of which he recognizes from his days as a drug addict; and Jonathan Minard’s “Moonrush,” a work-in-progress, chronicles the progress in sending a privately funded mission to the moon and focuses on roboticist Red Whittaker. Though many Hollywood films look at robots as malevolent forces – with zombies rating even lower - “Moonrush” director Minard is more optimistic about the future. “They’ll be part of our everyday lives,” even more so than they are now, he said, only growing more social with time. Exhibit A for robot sociability was a live performance by roboticist Heather Knight and her pal Data, a robot that has been programmed to tell jokes and – to the delight of the Oakmont audience – danced to Michael Jackson’s “Thriller.” Knight founded the Robot Film Festival, which brought the robot-themed films to Pittsburgh. 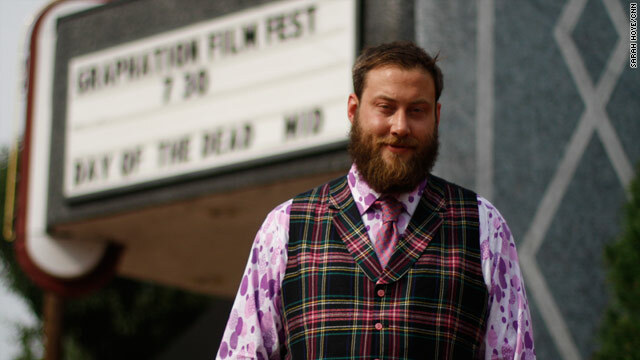 McGregor, dressed nattily in a bright, swirly-patterned French-cuffed shirt and plaid vest, believes that robots, zombies and humans can live together in peace. Robots, in particular, don’t have to be fearsome overlords; they can be useful tools, able to assist the elderly or go places we can’t. “Technology is only limited by people’s imaginations,” he said. Awesome things here. I am very glad to peer your post. Thank you a lot and I'm looking forward to touch you. Will you please drop me a mail? to tea party express: stop taking the money i've put into social security! i will need it later to buy more comic books when i retire. my other retirement fund will actually be able to pay my bills. Seriously Troll Party Express – did you forget that you're reading a blog titled "Geek Out?" None of us would be reading this blog (you included) if we weren't already all dweebs. The point of the article is to celebrate the dweebs who have had the vision and drive to turn their dweeby pursuits into a paycheck. Without dweebs like that, we'd have no art, no culture, no entertainment, and definitely no internet/Geek Blog/comments section. So take your jealous self-hatred somewhere else. I think they are firmly out of their Mom's basements, they are making art and serving the world by striving to make it an ever so slightly more beautiful place. Go back to work dweebs. Get outta mom's basement and earn a paycheck. ^^Funny how you have the time to make such an ignorant comment on an article that wasnt even in the headlines, so that means you clicked on it and read the whole thing...so whos the "dweeb" now? So how about you get out of YOUR mom's basement and not tear down other people's lifestyles because you are unhappy with your own. FAIL.